If you’re renovating your home’s exterior, consider adding a new deck to your home. It’s almost Summer and what’s better than entertaining friends with a barbeque and some lemonade out on the magnificently built deck? With a new deck, you’ll increase your home’s living area, being able to entertain and enjoy time with your friends and family outdoors in the nicer months. Plus, it’s an easy way to increase the value of your home if you’re thinking about selling or refinancing in the future. Adding a deck to your home may seem like a big job, but if you plan out exactly what you want, a professional will be able to complete your project in just a few short weeks. Some things to consider when building a new deck on your home or property; budget, timeline, and wish list. 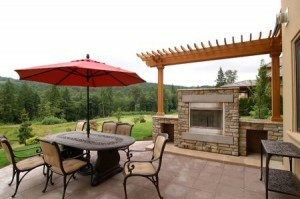 You can consider adding common things like fire pits, seating but additionally an amenity like an area for grilling. If you like to entertain, consider adding extra dimensions to sit and talk with guests. If you grill often, you might want to think about adding a built-in grilling area for making those delicious feasts. Another great deck addition is a fire pit, especially if you have kids who like to roast marshmallows or if you like to sit out under the stairs, staying warm with your company. All of these things come with a price tag, so make sure you consider your overall budget when you’re making your plan. Remember, adding a new deck to your home can increase the value of your home and will give you a new living space to spend time with your friends and family. At Merle Builders, we have the professionalism, experience and attention to detail to make sure that your new deck is a beautiful addition to your home. If you live in the Central New York area, contact us for a quote today and if you have any questions please feel free to ask.